It’s 5:40 a.m. Dawn has yet to peek over the mountains, and the forest surrounding Shonenji temple in Takachiho-cho still waits for morning. The priest’s wife (the temple bomori) wakes their sons, prepares breakfast, packs homework, odds and ends. At 6:25 a.m., they pause to chant at the family altar. 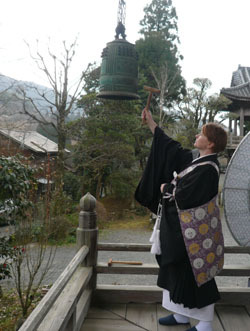 Her husband, Junsho, rings the temple bell. It’s a typical morning in the life of a not so typical, fully ordained Buddhist priest and British national. Victoria Yoshimura, 38, from Peterborough, England, started her life in Japan like many foreigners. Twenty-two years old, two weeks out of university, she came over on the JET language program. “My original idea was to learn a bit of Japanese, gain a bit of foreign experience, then return to England to get a job in PR or marketing,” Yoshimura says. Instead, she soon found herself dating a colleague at Takachiho High School, where she was an assistant language teacher. Here Yoshimura’s story takes an uncommon twist, for Junsho is the 17th generation in the family of priests for Shonenji, the 430-year-old temple nestled in this rural town of Miyazaki Prefecture. A relationship between the heir to the temple and a foreigner met with protest, both within the immediate family and the wider community. Yoshimura admits their determination may have fueled her own. “Sometimes I wonder whether all the opposition to our marriage actually pushed me into it further. I wanted to prove them all wrong.” It took two years for the family to accept the marriage. With the two older boys off to school, Yoshimura wakes her young daughter Sahara, and alternates temple duties with preparations for nursery school. Shonenji sits amid a forest with a view toward craggy mountains, adorned by rice fields and encroaching mists. The view from Yoshimura’s window, in a house shared with her in-laws, frames quintessential Japanese beauty, in all its verdant splendor. And all its rural superstitions. “Some of the community even warned that our children would be deformed,” she laughs. It was not just a battle about intercultural marriage — it was a war for the future of the temple. Reo is now 13 years old, and with his little brother, Renni, make up what Yoshimura refers to as “the heir and the spare.” Their births finally brought Yoshimura acceptance among the community. She was expected to settle down to life as a mother and temple accessory, fading to the background in demure contentment in this happily ever-after. It is now lunchtime; after sharing a simple meal with her husband, Yoshimura heads out to town, where she balances the responsibilities of the temple with teaching English. “Seventeen years after I came here, and I am back to being an ALT,” she says. Last autumn, Yoshimura resumed teaching duties, another way to contribute to Takachiho. When she first voiced her intention to become an active part of the community, to study for tokudo (ordination), Junsho and his parents were immediately supportive. Shonenji is part of the Jodo Shinshu Sect of Buddhism, a sect particularly open to having female priests. Ordination changed Yoshimura. “Suddenly everything became clearer once I started to learn why things were so, instead of following like a lemming.” After seven months of intensive studying, Yoshimura passed the preliminary exam and was ordained. “It was an amazing experience. Living and working in close proximity to total strangers in extreme circumstances.” Eleven days in seclusion with 70 other candidates, Yoshimura emerged a Buddhist priest. This fairy tale fit. This near tragedy prompted Yoshimura to take a more serious role in the running of the temple. “I decided to study for kiyoshi, the next stage up in priesthood.” With her husband’s precarious state of health, it meant Yoshimura could someday be head priest, if necessary. Attaining kiyoshi required months of study and another 11 days in seclusion, but she passed in December 2007. Evening draws near, and the temple drifts into shadows again. Reo and Renni burst through the doors in full kendo gear. Junsho coaches, and most days they study kendo together after school. Initially after surgery there was cause for concern — the cancer returned three times and demanded careful monitoring and followup — but Junsho now requires only monthly checkups at the hospital. Victoria’s day is nearly over, after a blur of laundry, temple obligations, English lessons; she will relax in front of the TV, watch a British DVD with her corgi, Hana. She tries to go home to England with the kids at least once every two years. Maintaining her British identity keeps a balance, but Victoria also credits the Association of Foreign Wives of Japanese, where she is currently vice president. “As soon as I got engaged I joined AFWJ. They are my surrogate family.” Victoria is looking forward to the annual convention this weekend in Chiba. Shonenji settles for the night, at peace. Victoria organizes one last stack of temple mail and gets ready for bed. She hopes to welcome more foreign visitors to the temple; she wonders about her current group of students, studying for the prefectural speech contest. She hears Sahara sigh in her sleep. Victoria Yoshimura closes her eyes. 5:40 a.m. will come only too quickly for this bomori.